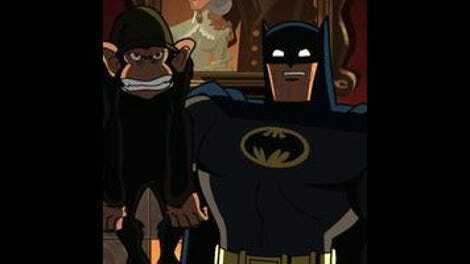 Batman: The Brave And The Bold: "Joker: The Vile And The Villainous!" "Joker: The Vile And The Villainous!" 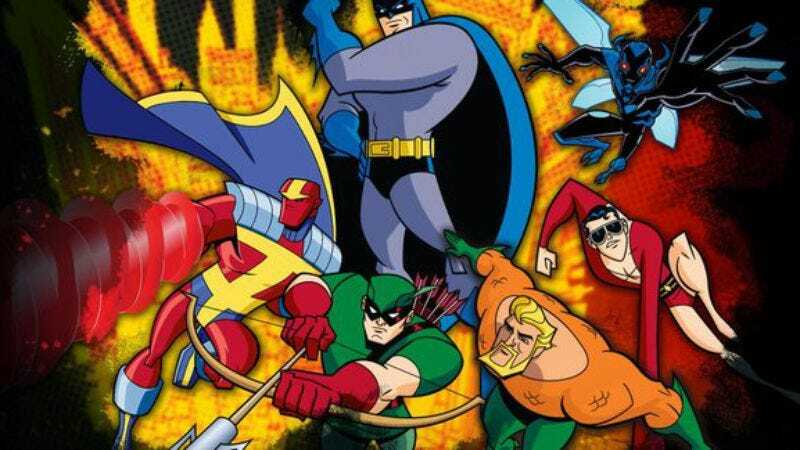 As a narrative inversion of the show’s usual formula, tonight’s episode serves as a reminder of Batman: The Brave and the Bold’s potential limitations. “Joker: The Vile and the Villainous” is perfectly enjoyable but its bound to be outshown by the last three week’s worth of superior narratives. The episode’s opening mini-segment introduces the viewer to the episode’s main gag: villains are tonight’s heroes and vice versa. Writer Jim Kriegg starts with a Batman-less segment involving Kamandi and the Misfit to establish the alien-ness of the episode’s Bizarro structure. We did just see these same character duking it out last week, after all. So when a Bat-shaped silhouette appears from the future, we expect it to be the Caped Crusader. Instead, the time traveler is the Joker and he’s not there to help Kamandi but rather to aid the Misfit in gaining control of the nuclear warhead that Tuftin and the other residents of Tiger City ritualistically worship like a god. No one comes to Kamandi’s rescue because this time, the bad guy called in the cavalry and is going to benefit from some much-needed teamwork. The usual slow-mo beat-em-up montage sequence that harkens back to the Bif-Bam-Pow fight montage sequences from the Adam West-era Batman tv show now highlight the victory the bad guys’ over the good and not the other way around. I don’t blame you if you’re already tired of reading about the different ways that Kriegg toys with The Brave and the Bold’s recognizable plot structure. The joke is a bit thin to begin with even if it’s understandably one that Kriegg mostly pulls off thanks to his and series director Ben Jones’s abilities as meat-and-potatoes storytellers. But in a series that constantly emphasizes symmetry as much as The Brave and the Bold does, one has to wonder why Kriegg felt it necessary to open with another Kamandi. It’s impossible to miss his joke: he repeats throughout the A-narrative in “Joker: The Vile and the Villainous.” By turning the structure of last week’s B-narrative inside out, they make a one-note joke even more monotonous, which is especially deadly since the Joker’s jokes are, as usual, never really that funny. While Kriegg most likely only did what many other of the show’s writers do more successfully, by letting the episode’s pervasive punchline set the episode’s piece, he got his priorities mixed priorities. This is similar to the way that season one backed itself into a corner with the cosmic super-villain Equinox, an amoral character that’s obsessed with restoring balance in the universe at all costs. By the time you get to “The Fate of Equinox,” the character’s novelty has already worn out. But again, the A-narrative in “Joker: The Vile and the Villainous” is mostly decent even if it is conceptually tiresome. Joker conspires to stop the seemingly omnipresent Batman by helping the Weeper, the first super-villain to use a gimmick, come out of retirement and return to prominence as Gotham’s most deadly villain. They meet in a bar and reminisce about the big victory that would have but didn’t send the Weeper over the top in the annals of villainy. A battle between the Weeper and the Bulleteer ends in defeat but only because the Weeper hesitated at the thought of murdering an entire city of Gothamites (He isn’t named the Weeper for nothing). From there, the Joker tries to get the Weeper, one of the most obscure DC villains (Trivia buffs will not that he was originally a Fawcett character) on the show to date, back into the swing of things. Since tonight’s episode is slavishly motivated by Opposite Day logic, the Joker doesn’t restore his confidence by presenting him with challenges that are successively harder but rather easier. The Weeper starts by robbing a bank and ends up stealing a lollipop from an infant, a joke that the Joker kills by laughing about how “that was like stealing candy from a baby,” right after the Weeper presents him with the purloined lolly in question. This segment was the tipping point for me. I got the joke as another iteration of the episode’s Bizarro sensibility. But after this sequence, I just didn’t really want to laugh at it anymore. The one inversion of Brave and the Bold that I consistently got a kick out of in “Joker: The Vile and the Villainous” was Kriegg’s depiction of Batman as a vicious crime-fighter. Like the Batman we know, this tyrannical version of the Dark Knight stops at nothing to quell crime and looks like a bully for it. I especially like the scene where he attacks the Joker and the Weeper using missiles launched from the Bat-mobile. He does this after telling the Weeper that he’s just too old to be a super-villain and then taunts them both with a typically corny one-liner: “Justice always has a way of evening the odds.” And then he fires a couple of bat-missiles at them and buries them in rubble. The inexplicable mean-ness of that scene makes the Weeper’s comeback later in the episode—“You’re never too old—for evil.”—that much more satisfying. If only the establishing details of tonight’s main gag were that funny throughout the episode.